The hoplomachus was a type of ancient Roman gladiator that was seen in the arena in the late Imperial Period. These gladiators resemble the Greek soldiers known as hoplites and they were usually paired against a murmillo gladiator who were typically armoured to look like a Roman soldier. This pairing was in reality a way for them to depict the larger Roman war against the Greeks on a smaller scale inside their prestigious arenas. It is speculated that samnites were called hoplomachi when battling the thracian and a secutor when matched against a retiarii therefore making it a subclass instead of having its own group of gladiators. Moreover, it is believed that the replacement of the samnite gladiators with the term hoplamachus came about because they became allies with the Romans and were no longer portrayed as enemies. The weapons of the hoplamachus gladiator bore striking similarities with the hoplite solider weapons as the hoplomachi typically wielded a Dory spear and a short sword the gladius and a short dagger known as a pugio. With such a wide variety of weaponry, the hoplamachus was capable of fighting from various ranges of distance. With the dory spear they could attack from medium to long range, and keep themselves protected at the same time. With the standard issue gladius, probably the most popular weapon of gladiators, the hoplamachus was on an even footing with their foes. Should the battle get uncomfortably close they could quickly pull out their dagger and try to land a fatal blow up close! 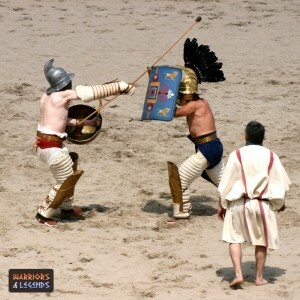 Two hoplomachus gladiators battle in the Roman ampitheatre. The hoplamachus typically fought with bare chest and dressed only with a loincloth, known as a subligaculum that was supported by a belt known as a balteus. In addition, he had the usual high linen greaves that protected the knee and shin and reached as high up to the middle of the thigh. On his right arm is a metal arm guard or a segmented cotton referred to as manica, and was typically used to protect the weapon bearing arm of a gladiator while striking. The hoplomachi helmet had a visor, a feather on both sides and a crest, almost similar to a Thracian’s helmet. The helmet was patterned after the armour of the Greek soldiers known as Hoplites, and as we mentioned was a broad rimmed iron helmet with a visor known as the Falconum Cassis that may have a falcon decoration or a crest and a feather on each side. The hoplamachus was also equipped with a small round bronze shield parmula that was much like the Greek Soldier Hoplite’s shield. The parmula was more commonly known as aspis, and was very distinctive in its shape. The bronze shield called the parmula resembled a Greek hoplite’s shield. It was small and round therefore allowing a hoplomachus to hold a dagger pugio or a short sword gladius graecus as a secondary weapon in the left hand and a spear Dory in his right hand. The hoplomachi typically fought two other Roman gladiator classes, the murmillo and the thraex. 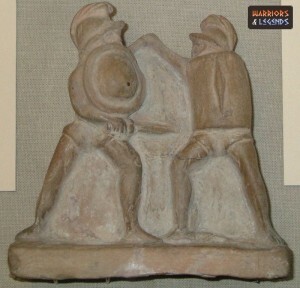 A stone relief of a hoplomachus gladiator. The name hoplomachus small shield was used not only for defence but as a weapon itself to injure their enemies by ramming against him at the start of the fight. By using the shield effectively as a battering ram, this gladiator could put their opponent off their footing and then land a dangerous strike they might not have otherwise. The hoplomachi spear gave them advantage in reaching the enemy and striking him down without getting too close for comfort. It could also jab the opponent’s shield to tire the enemy’s arm and shoulder, the kind of fatigue that could pay later in a battle. Additionally when the gladiator threw their spear he would still be armed with the short sword for any close combat action. The primary reasoning behind this gladiator class was to represent a potential enemy in the amphitheatre, with this gladiator mimicking the Greek warriors of the time. The word hoplamachus was actually derived from Greek and refers to ‘fighting with weapons’ with hoplon meaning ‘weapon’ and and machein meaning ‘to fight’. Based on the Greek hoplites this gladiator also bore similar weapons a spear and a short sword. It was common for the armour of a hoplomachi to weigh up to 17-18kg, so the hoplomachus falls into the category of a heavily armed gladiator. This was reflected in their fighting style as they were usually short and stocky fighters, capable of carrying heavy weight and still moving effectively.